February is National Children’s Dental Health Month, a time to take stock of how your youngest patients are caring for their teeth. As someone who manages a practice, you know how important children’s dental health is. Good habits and experiences with a dentist can build a lifetime of healthy teeth and gums. 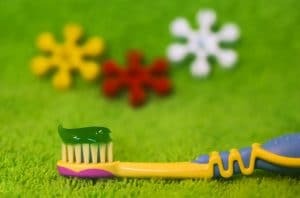 This is the perfect time to promote children’s dental health on any and all of your social media channels. That’s why, in today’s blog, we offer some helpful ideas to engage your audience with this important topic. When you’re creating content that is instructional and informative, video is often a great option. Video engages multiple senses and allows your audience to put a face with the content. Both Facebook and Instagram give boosted signals to live videos (for right now), so “going live” with some tips to help kids take better care of their teeth is a great way to draw in your audience. We’re all about these fun photo booth backgrounds that you’ll find in our client social media kit. Setting up a photo booth background with fun props gives kids and parents a fun opportunity to take pictures of themselves and share them with their friends. Using your network of patients to reach out to their network is a great way to boost reach for this important topic. Engaging your community doesn’t just happen online. This is a great time to schedule a live event where you can speak at a local school or in your office about the importance of children’s dental health. Again, putting a face and name with the topic makes it more approachable for children. Doing something like this also helps you establish yourself as an industry expert. Another great option for promoting children’s dental health during February is to offer a special for children’s dentistry services. It’s important to communicate with parents about how vital their children’s dental health is to their overall wellbeing. Offering an incentive to make an appointment now helps them receive the treatment they need. We specialize in dental practice marketing, so we’re always looking for ways to help you build and engage your clientele. When the people you serve are informed, they stay on top of their dental health, and that’s what’s most important. If you’re looking for digital marketing solutions to help your practice grow, contact MDPM Consulting in Dallas, TX at 972-781-8861.